The application is open until November 15, 2017. 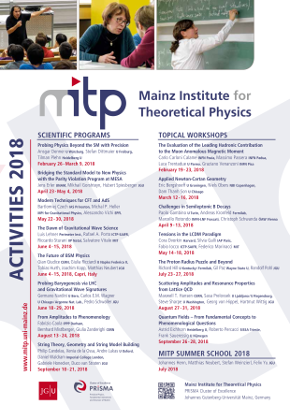 The topical workshop is meant to have a particular focus directed towards the hadronic contribution to the anomalous magnetic moment, both analyzing the most recent experimental results for its determination in time-like processes as well as taking into consideration the most recent dedicated lattice calculations. In this context a particular attention and a series of seminars and discussions will be devoted to consider a recently proposed possibility of extracting the muon anomalous magnetic moment by using a different and alternative method exploiting experiments consisting in space-like processes, e.g. as the Bhabha scattering or t-channel in μ-e scattering. For this purpose, it is planned to discuss and to explore in detail the state of the art of precision radiative corrections to Bhabha/ μ-e scattering in order to master the theoretical tools necessary to develop dedicated Monte Carlo simulation codes. Finally, it is planned to survey the experimental challenges facing the extraction of the hadronic contribution to the running of the electromagnetic coupling constant in space-like processes. The foreseeable impact is represented by the possibility of testing the consistency of the Standard Model at the level of quantum corrections with an unprecedented precision as well as the one of ascertain the presence of New Physics virtual effects in a robust (and unambiguous) way.